Colorado Governor John Hickenlooper created a task force Tuesday, October 6th to address the offensive representations of American Indians as mascots in his state. As a result, schools with mascots like the Lamar High School Savages and Eaton Reds may be forced to come up with new icons. 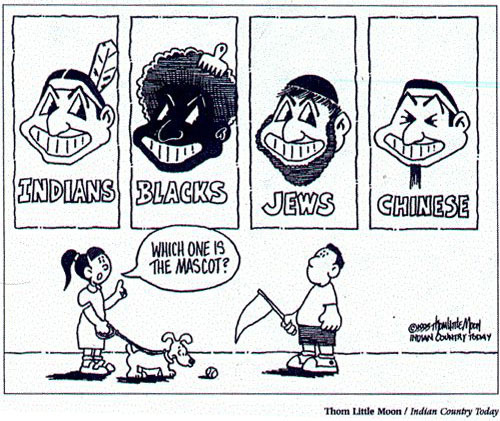 In hopes of reducing and eliminating derogatory mascots that trivialize and disrespect American Indians, Hickenlooper’s task force includes representatives from both education and indigenous groups including: the Southern Ute Tribe, Ute Mountain Ute tribe, Colorado Commission of Indian Affairs, Denver American Indian Commission, and Native American Rights fund. This task force looks to address the disrespectful use of mascots by creating an open dialogue between school, community, and Indigenous representatives. Furthermore, the task force will reach out to communities affected by these mascots. The task force will also create lists of recommendations for the State of Colorado to correct and address the insulting mascots. The dehumanization of American Indians is ingrained in society and taught to be acceptable, as evidenced by sports mascots like the Washington Redskins. Imagine if a team adopted the team name Yellowskins or Blackskins, and presented a stereotypical image for the mascot, the public would be in uproar. People are failing to hold American Indian culture up to the same levels of cultural protection, this is a result of their culture being hidden and constantly undermined. American Indians are among the most marginalized peoples in the United States, and until the media recognizes offenses to American Indian culture as equally harmful and disrespectful as offenses to other cultures, the dehumanization of American Indians will continue. Hickenlooper’s task force seeking to dismantle the misuse of American Indian culture is an example of a growing recognition nationwide for regulations preventing the trivialization of American Indians through offensive mascots.The California Racial Mascots act was signed by Governor Jerry Brown on October 11th, which specifically bans the use of mascots that offend or trivialize American Indian culture. The California Racial Mascots Act specifically defines Redskins as a derogatory term, and prohibits public schools and sports teams from adopting such a name. Furthermore, the law requires that schools currently using a derogatory mascot or name change to an icon that does not trivialize culture. To ensure that the law is complied with, the California Racial Mascots Act will help subsidize the costs associated with changing mascots and purchasing new gear. Governors Brown and Hickenlooper set an example for addressing problems of cultural degradation for American Indians in the United States. Offensive mascots impact the lives of American Indians by creating an environment that celebrates the disgrace of American Indian culture, and laws that look to address inequality in the United States have always been necessary to help fix marginalization. By looking at Colorado and California, hopefully other States can follow suit and help prevent the offensive use of American Indian mascots.